RENO, Nev. — Visitors to federal rangelands with significant tracts of sagebrush pumped about $1 billion into the economy in 11 Western states last year, according to a study released Tuesday by advocates of protecting sage grouse across the region. The study is the first of its kind to examine the direct and indirect economic impacts of recreation spending tied to U.S. Bureau of Land Management property with habitat for sagebrush-dependent species, according to the Pew Charitable Trusts. Hunters, campers, fishermen and others spent more than $623 million directly within 50 miles of Bureau of Land Management property in sagebrush ecosystems across more than 61 million acres, said the report by ECONorthwest, an economic consulting firm founded in Oregon in 1974. The most money was spent directly in Idaho with $126 million, the report said, followed by Nevada, $88 million; Wyoming, $87 million; Oregon, $75 million; Colorado, $50 million; and Utah, $39 million. The ripple effect of that spending in the form of indirect and induced investments produced a total economic output of $1.06 billion, including $172 million in Idaho, $152 million in Montana, $119 million in Nevada, $108 million in Wyoming and $103 million in Oregon, the report said. Pew commissioned the study with the Western Values Project, a nonprofit group that advocates a balance between energy development and conservation. “Protecting greater sage-grouse habitat is not just wise conservation policy, but also sound economic policy for the West,” said Ken Rait, director of Pew’s U.S. public lands project. The U.S. 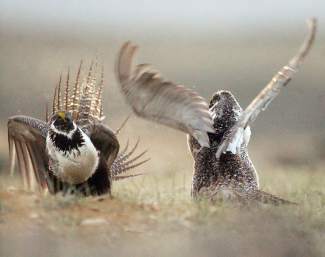 Fish and Wildlife Service is considering listing the greater sage grouse as a threatened or endangered species, a move critics fear could have a negative economic impact in the form of restrictions on oil and gas exploration and livestock grazing on public lands. Officials for the Washington D.C.-based Public Lands Council, which works with the National Cattlemen’s Beef Association and other livestock groups, said the study demonstrates the economic importance of access to public lands but that its focus is too narrow. Biologists consider the greater sage grouse to be an indicator species whose population numbers signify the health of the entire sagebrush ecosystem that supports a wide array of wildlife. The researchers used the Bureau of Land Management’s 2013 visitation data for areas with at least 10 percent sagebrush cover and plugged them into a formula similar to one the Forest Service’s Pacific Northwest Research Station used last year to calculate visitor spending averages at national forests. The estimated 67.8 million visitor days to the bureau’s sagebrush lands included 27 million primarily for camping and picnicking, 7.9 million for off-highway travel, 7.1 million for non-motorized travel, 5.7 million for hunting, 4.4 million for special events and activities and 4 million for viewing public land resources, the report said. Nevada Department of Wildlife spokesman Chris Healy said sage grouse live on the same lands where Nevadans hunt mule deer, elk and chukars. “A lot of those hunters live in urban areas, so they load up their trucks and buy gas and rent motel rooms and buy meals,” Healy said.